If you read the first installment of our ScienceCafé invasive species series, you may have already guessed the name of this topic: Pueraria lobata, or… kudzu! Before kudzu arrived in the states and poison ivy was the only three-leaved vine, times were simpler. No one worried about kudzu invading their yard and killing their plants or damaging telephone poles, or was made to suffer the accompanying stench of the kudzu bug. This weedy invasive has spread from Connecticut to Florida and west to Texas, and is most prevalent in the southeastern states of Georgia, Alabama, and Mississippi. How did this come to be? The story of kudzu in the US began in 1876 at the Centennial Exposition in Philadelphia, when Japanese visitors brought various native plants from their homeland, including the infamous kudzu (or kuzu in Japanese). After kudzu’s debut in the states, Southerners in particular desired to grow it for shade and the beauty and aroma of its flowers. In the southern US states, growing conditions were ideal due to the hot and humid climate coupled with the absence of kudzu’s natural enemies such as herbivores, insects, and soil pathogens. However, people are mostly to blame for giving kudzu an advantage over native plant species. The American government and a small cohort of kudzu supporters saw the plant as a solution rather than a problem. For instance, during the Great Depression Era, farmers were paid, by the federal government, to plant kudzu for 8 dollars an acre! This subsidy was granted as a remedy for widespread erosion caused by poor farming practices. Soon after, the plant began to “eat the South” and was listed as a noxious weed by the 1950s. 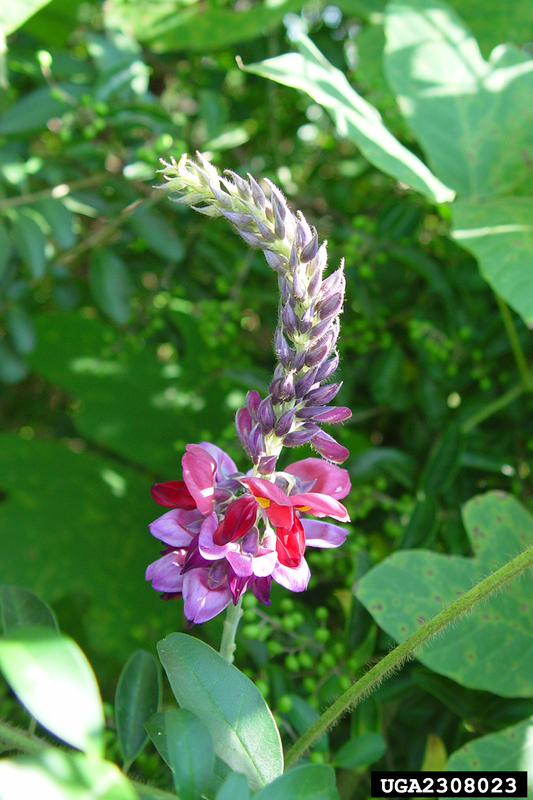 Kudzu is related to peas and beans, but is no ordinary garden legume. Kudzu will grow up to 1 foot per day with lots of sun and rain, but is also drought-tolerant. 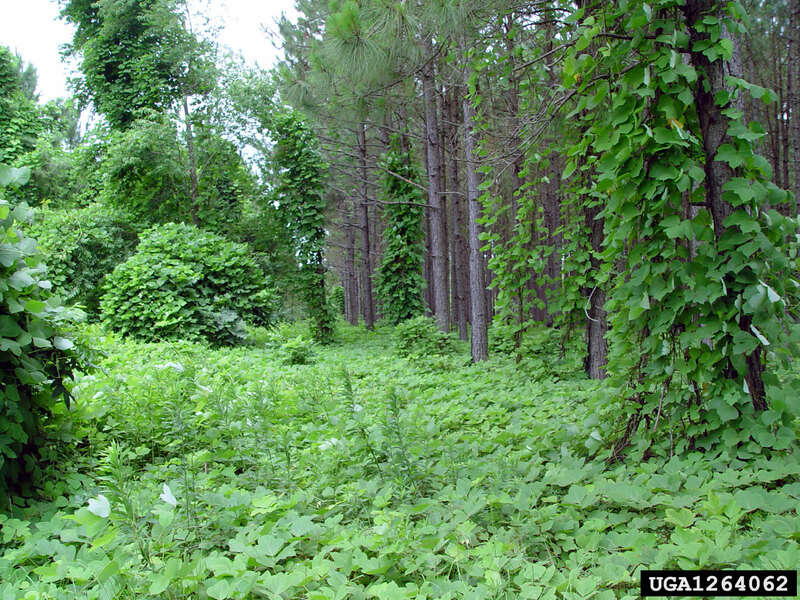 Kudzu will shade and suffocate native plants with its massive leaves and constricting vines. It is efficient at photosynthesis and like a well-oiled machine, stores up carbohydrates in extensive tuberous roots. The root is precisely, the root of the problem: to get rid of kudzu, you must kill the persistent parent root, which can be up to 12 feet in depth, 1 foot in diameter, and up to 300 pounds! These large roots can radically alter soil conditions. From these underground starch roots, the vines draw water, nutrients and carbohydrates, robbing the surrounding native vegetation of sunlight, water, nutrients, and space. This ecological issue is augmented by its repeated reintroduction, cultivation, and escape into the wild where it continues to invade wherever it takes root. Can it be stopped? There are many methods of kudzu control: herbivores, herbicide, and more recently, helium, to name a few. Using herbivores such goats to manage vegetation is an age-old practice, but seeing goats grazing on urban and suburban lands is a novelty to many Americans. It may take several years and lots of munching, but hiring goats is cheap and they have a low impact on soil structure and water quality in comparison to cows and other large grazers. In addition, goats are browsers, meaning they prefer leafy and woody vegetation such as kudzu to tender herbs such as a rare wildflower species. Herbicides cost the US millions of dollars and take a toll on the environment as well. Spraying close to waterways, for example, poses a threat to the aquatic ecosystems that we and other living things rely on. Glyphosate, a chemical commonly used to combat kudzu, may not only pose a threat to human health, but also affects the growth and development of environmentally sensitive organisms such as amphibians. Although it may seem daunting, many have answered the call to fight this green alien invader. Jacob Schindler, a student at UGA, invented a device that drills into the soil and injects helium gas near the parent kudzu root, annihilating the whole network of a single plant! Though this may be the closest thing to a silver bullet for killing kudzu, resources and funds may not be currently sufficient considering the large scale and complexity of the issue. As the technology develops, the method may be more cost-efficient and easier to acquire. The bottom line is that patience and perseverance will probably be the most valuable assets in a kudzu eradication plan. In countries like Japan, China, and Korea, people value kudzu and use the whole plant, paying a good price for it. In the US, we have just about had it with our kudzu problem, yet people are still purchasing kudzu products from Asia on the Internet, even if there is a gold mine of it growing just down the road. There is a need for an economical and practical method of harvesting and making it marketable in the South where it is both abundant and a nuisance. Whether you see kudzu as a friend or a foe, I hope you take time out of your day to connect to kudzu, especially if kudzu is part of your local landscape. Whether that means clearing kudzu from your local park or harvesting it for food or even art, we can start to reclaim land and turn it into a societal and economic benefit. In turn, our native flora and fauna will benefit too. Kudzu has already compromised about 7 million acres of US land and as a result, spaces for human and wildlife are shrinking in functionality and biodiversity. The environmental, economic, and social implications of kudzu invasions must not be understated. Informed action needs to be implemented, especially in the face of climate change and rapid human development of the natural landscape. http://maxshores.com/the-amazing-story-of-kudzu/; Li, Z., Thomas, Dong, Q., Albright, T.P., Guo, Q. 2011. Natural and human dimensions of a quasi-wild species: the case of kudzu. Biol Invasions 13:2167-2179. Suzie Henderson is an undergraduate student in the Odum School of Ecology at the University of Georgia. Other than goats, she loves learning, gardening, cooking, and her family and friends. Connect with her on Facebook or email her at suzieuga@uga.edu. ← Can We Resurrect the Mammoth?